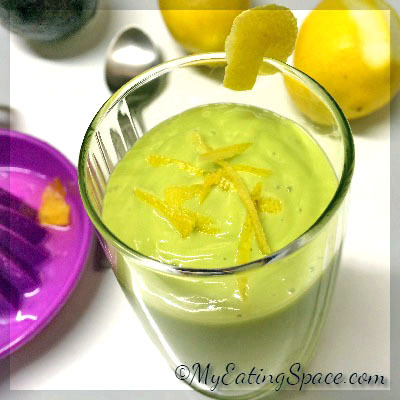 Avocado lemon smoothie is a simple to make dessert for unexpected guests. The smoothie makes a filling breakfast dish also. Avocado gives a rich texture for the smoothie, thanks to the natural oils in this healthy fruit. They are rich in healthy fats and proteins. Lemon gives an extra indulgent flavor,especially the lemon zest. I always try to keep two to three avocados on my kitchen countertop. 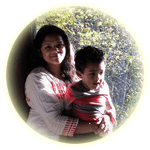 This helps me a lot on busy or lazy days. The avocado lemon smoothie is very easy to whip up. Since avocado is a naturally health friendly fruit, this smoothie will help you to lower the bad cholesterol. 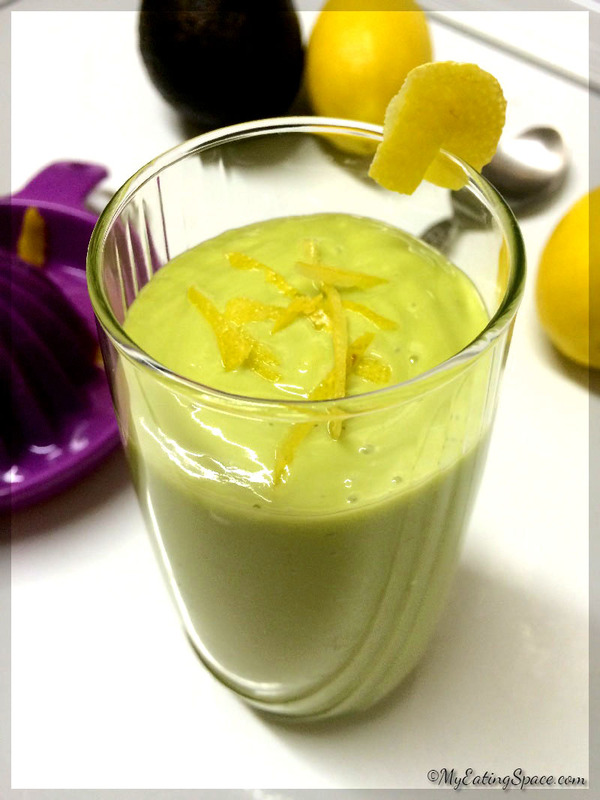 The buttery green colored avocado lemon smoothie makes a filling breakfast or dessert. Watch the video on how to make the easy avocado lemon smoothie (milkshake). The printable version of the recipe is also provided. 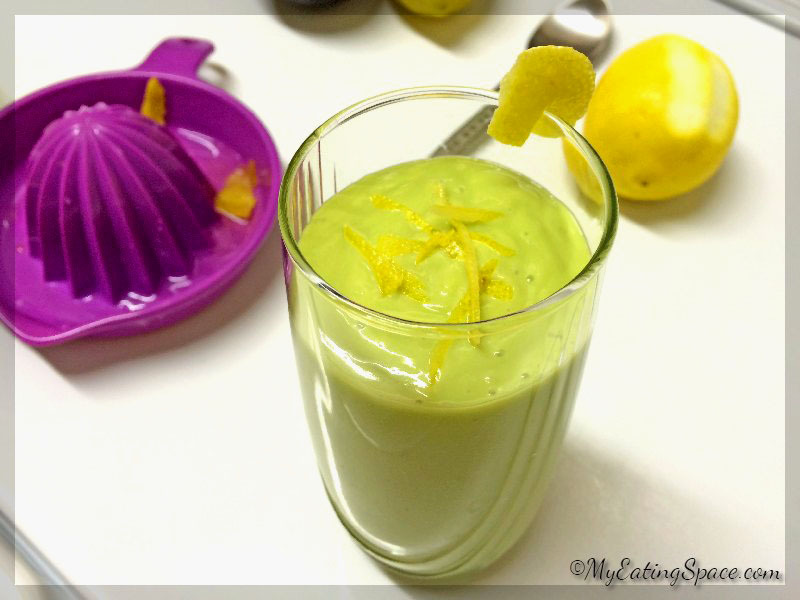 A delicious buttery shake with a vibrant green color and lots of nutritional benefits. The lemons make it a decadent dessert which is easy to make. Scoop the flesh from the avocado. Add the avocado flesh, lemon juice, lemon zest and sugar into a blender. Then add the milk and blend again to mix. 1. Use the sweetener of your choice and adjust the sweetness to your taste. Adding an avocado to your smoothies may help you to absorb more antioxidants. I couldn’t even believe that I am the one who threw away the avocados when I tasted it first. Now avocado is my favorite fruit and I add it to every smoothie I make.